The MCT466 QuikCheck is a reliable and sturdy at-line, NIR Tester for use in harsh manufacturing environments. 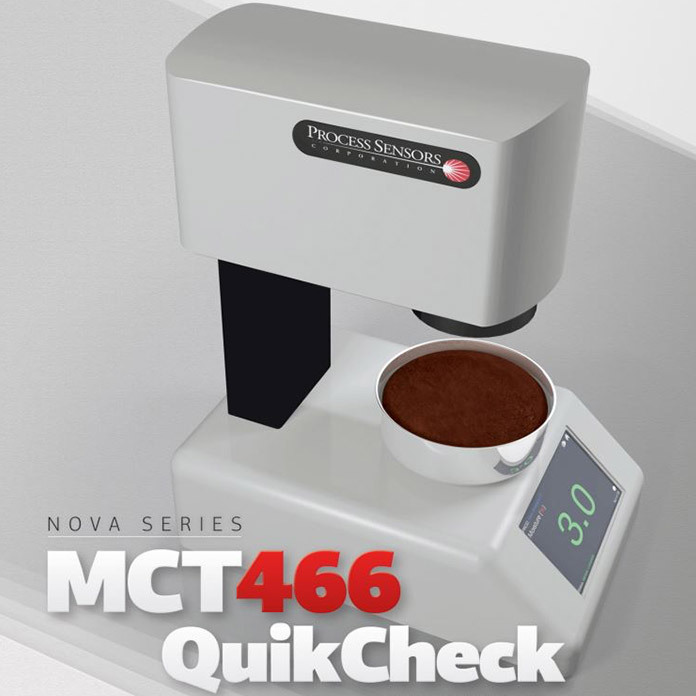 The MCT466 QuikCheck is routinely used to measure moisture in samples taken from the production line. However, other measurements can be made, including oils, protein, film thickness, coating weights, nicotine and sugars. Many products require no sample preparation. Sampling error is reduced because of the rotating dish that permits the MCT466 QuikCheck optics to “see” multiple surfaces and average hundreds of measurement readings. However, some products can be relatively thick, with moisture trapped inside. In these cases, it is wise to break up the sample so that the internal moisture is exposed to the surface. Shining light at specific NIR wavelengths causes common molecular bonds to vibrate and absorb energy. By comparing the absorbed energy at “measured” wavelengths to non-absorbing “reference” wavelengths, the MCT466 QuikCheck can accurately and repeatably measure moisture, oils, fats and other parameters based on the samples’ chemical composition. The O-H bond of water (H-O-H) vibrates at 1.94m and 1.43m. The H-C bond of organic hydrocarbons and oil vibrates at 2.34m and 1.72m. The appropriate overtone wavelengths are selected based on concentration levels of the component to be measured.